Watch full One Piece Season 15 Episode 13 English Dubbed full HD online. One Piece Episode 529 English Dubbed online for free in HD. The Fish-Man Island Will Be Annihilated?! Sharley’s Prophecy! 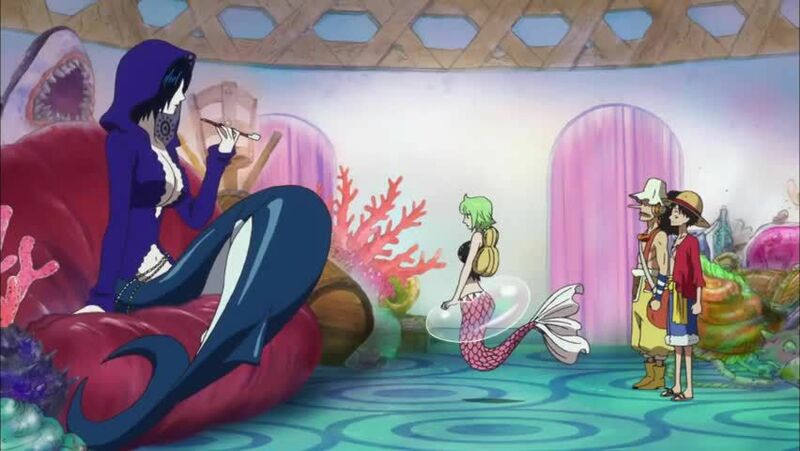 Sanji is given a transfusion from two okamas on the Mermaid Cafe, a local restaurant in the port town of Coral Hill. Chopper reveals that not only has Luffy was poisoned, but thanks to the captain’s battle with Magellan, he has built up an immunity to it. Meanwhile, Camie asks Madame Shirley, a fortune teller and proprietor of the restaurant, about Sanji and has Luffy and Usopp enter her room. It is revealed that Sharley has predicted the Great Pirate Era and the past wars, including the death of Whitebeard. Later, the Straw Hats reunite with Brook and Pappagu. It is also revealed that Vander Decken had sent a letter once a week to the Princess. As a result, Neptune and his sons formed an army and have been finding Vander Decken for years. When Luffy asks about the candy factory nearby, he learns that the island is under the protection of Big Mam since Whitebeard’s death. Meanwhile, Sharley is dismayed about her prediction that the island will be eventually destroyed by Luffy. 5 / 5 - 48 ratings.